For quite some time I have been working on creating a delicious gluten and grain free sandwich bread. Well, I think I finally have come up with the perfect recipe to complement any sandwich. This bread is not as dense as an all coconut flour loaf and has a nice sweetness to it. You can toast and put some jam or honey on it or my favorite way to enjoy it is to take 2 slices of bread top it with some turkey and a little raw cheese, leave it open faced and put it in the toaster oven until the cheese is melted and turkey is heated through. Enjoy! I finally have come up with the perfect organic gluten free & grain free sandwich bread recipe to complement any sandwich. With a mixer blend together coconut oil (cooled), eggs, honey, and applesauce. In another bowl combine coconut flour, almond flour, salt, baking soda and baking powder. Add these dry ingredients to the wet ingredients and blend on medium speed for 2 minutes. Transfer to a heavily greased glass 5×9 loaf pan or two mini loaf pans. Bake for 40 minutes for mini loafs and 50-55 minutes for one large loaf pan, or until the center comes out clean with a toothpick. Allow cooling completely before slicing. Thanks for posting this. Perfect timing, I just told myself that it was time I try life without gluten. I will try making this tomorrow. I’ll be sure to share my reaction. Your recipes are a blessing. Thanks for sharing them. I still wish you were my neighbor…tried talking one of my kids to add that wish to their Christmas list. Ha. Can this be made with egg whites and not whole eggs? Sounds delicious. Given there are so many eggs in this recipe, what could be their substitute to maintain the consistency and texture of the loaf? Could gelatin be used? Can you substitute the almond flour with coconut flour or oat flour in the pumpkin bread? You could try the oat flour and see. If you do the coconut flour, I would replace the 2 cups of almond flour with 1/2 cup coconut flour. Rule of thumb, for every cup of flour you only need 1/4 cup of coconut flour. Newbie here again lol Can I ever replace coconut flour with spelt flour? Coconut flour hard to find here. the 236.8 calories,is that per slice? @LynnCarangelo Yes Lynn it is per slice. The majority of the flour is almond flour and although it has a higher calorie count, it is full of nutrition. You could make the slices smaller if you want and see if that works better for you. @LynnCarangelo Thanks for the compliments 🙂 Spelt is a grain so if you are trying to stay away from grains you need to stay away from spelt. 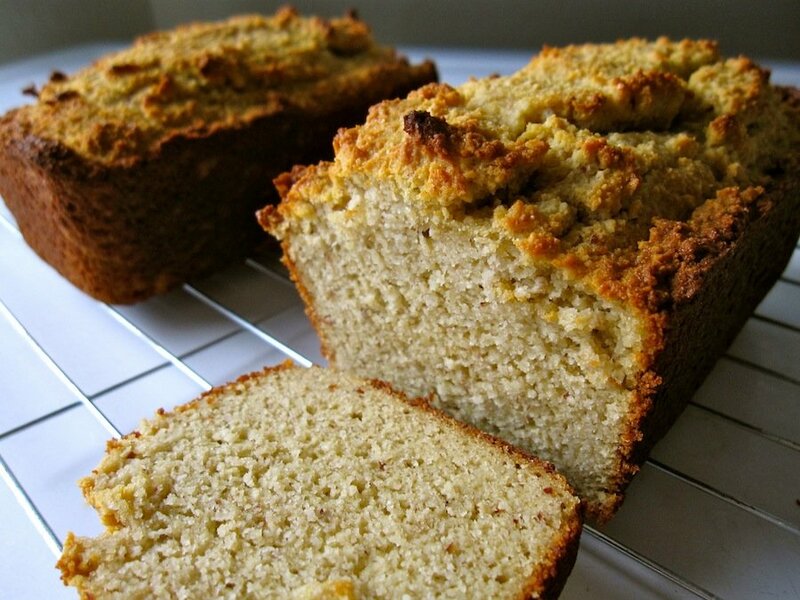 You might want to try my banana bread…it is made with all coconut flour and has less calories. 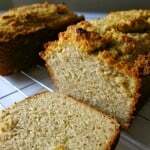 https://wholelifestylenutrition.com/recipes/organic-banana-nut-bread-recipe/ I think it would taste great on a sandwich! I’m very interested in trying this but 6 eggs seems like an awful lot for 1 loaf of bread. Is that really what it’s supposed to be? Thank you in advance. @Helinbed yes 6 eggs is right. You do not have gluten in this bread so that is what helps it rise and keeps the bread together. Going to try this and am wondering how to store it? How long will it keep? Thanks. I like to let my loaf cool and then I slice and put it right into the freezer. It has no preservatives so I would eat it up within a few days if not freezing. Just wanted you to know I make this bread weekly for my son who eats gluten free. I like that it is full of wholesome ingredients without all the usual junk, gums, sugar, and empty calories found in many GF products. And although pricey because I use pastured eggs, I love that it’s full of eggs/protein. Thanks so much. So happy that you are enjoying this bread! It is my families favorite! Making my first loaf right now, it smells just wonderful. Cannot tell you how excited I am to have some homemade gluten free bread. Thanks. What is your favorite cracker recipe, that will be my next challenge. The bread was superb. I froze some slices and later toasted it when I was having a bread craving. Excellent toasted with a little butter. Thanks so much, great recipe! I will try the cracker recipe next. Just made this bread yesterday and had some toasted with some goat cheese and fresh onion and tomatoe for lunch. Very nice. I used half a cup flaxseed and one and a half ground almond flour and added some pine nuts and hemp seed, yummm! That sounds GREAT Karin! Thanks for sharing. You know what would have thrown it over the top for me? Rosemary! Can’t wait to try your version! Will this bread hold up well for cold sandwhichs filled with a lot of ingredients? A lot of homemade breads falls apart when used that way. Or maybe its just my baking? Can you substitute maple syrup for honey? Thanks! I’m sure you probably could, however, I haven’t tested that. I am new to all this and I made this last night. First time making any. I smelled wonderful cooking.. then I tasted it an wow it is just so different. I knew it would be. Wasn’t sure what to expect. But I made a sandwich out of it at lunch an it wasn’t bad. I was told that it would take some time to adjust to the new foods. I will make this one again. my Granddaughter and I are both on a gluten free and grain free diet ,,, so we made this bread today !!! thank you !!! It is amazing We were o trilled eat BREAD again!!! Delicious!! I’ve made this recipe twice now…..once as a single loaf and today i doubled the recipe for two loaves. Both times I baked it as long as I could without burning the bottom and even though my stick came out clean….there is still a little “too moist” spot. I’m wondering if i cut the applesauce back just a little if that would help. Also I use mostly XL eggs so maybe cutting back 1 egg as well? Any thoughts? Most importantly this is a delicious bread! Could you replace applesauce with something else in this recipe? Any idea if this would work in a bread machine? Can you tell me if the loaf should be left to cool in the tin or out of it?? I cool it out of the pan.